If you like to kick off your mornings with a nice tall glass of juice, or enjoy mixing up your mimosa game with different juice variations, you may want to cut back a bit on how much you're knocking back. That may be the wisest move at the moment in light of a new report that found dangerous levels of heavy metals like arsenic and lead in some of the most popular fruit juices on the market. A number of popular fruit juices made by several major brands may contain a concerning amount of heavy metals, according to brand new research published by Consumer Reports on Wednesday. 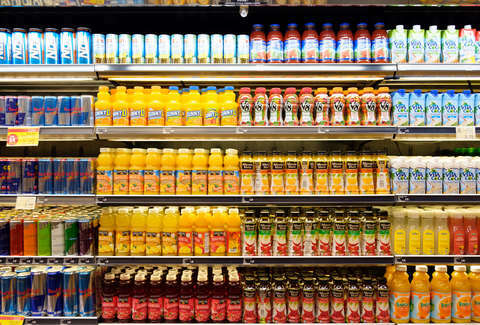 The alarming news comes following a study conducted by CR where it tested 45 different packaged fruit juices, and found measurable levels of metals like lead, arsenic, and cadmium in every single one. The findings were troubling enough that CR is actually recommending parents give their kids less juice. To conduct its research, CR looked at 45 juices from a number of well-known brands including Apple & Eve, Capri Sun, Honest Kids, Ocean Spray, and Welch's in four flavors: apple, grape, pear, and blends, then subjected samples of each from different parts of the country to tests. It found that every single one had measurable levels of at least one heavy metal it tested for (cadmium, inorganic arsenic, lead, or mercury), and 21 of them had concerning levels of either cadmium, inorganic arsenic, and/or lead. As for how risky consuming these juices is, CR claims that seven of them could harm kids who drink four ounces or more of it per day, while five of them pose a risk to adults who drink the same amount. Long-term exposure to the heavy metals CR tested for can put people at higher risk of things like kidney disease, diabetes, high blood pressure, and certain types of cancer according to the Centers for Disease Control and Prevention (CDC), per a CBS News report. Now, before you go raiding your fridge and pantry for juice to throw away, CR isn't necessarily recommending you cut it from your diet, but rather cut back a bit, especially in the amount you're giving kids. It would also like to see the FDA implement stronger restrictions limiting the amount of these metals allowed in juice. "They should be concerned but don't panic… frequent exposure to these heavy metals through the juice is the concern," CR's chief scientific officer James Dickerson said in an interview with CBS News. It's also important to note that CR contacted all of the companies who make the juices it tested, and the majority of them responded saying they adhere to government regulations and that heavy metals can be naturally occurring (which is true to a degree, as things like arsenic can be naturally found in soil, water, and air). The Juice Products Association had a slightly stronger reaction, calling the results of the study "unfounded" in a comment to CBS News. For what it's worth, Consumer Reports didn't call out any brands in particular, and made clear that this research was only meant to be a "spot check" of the market to address the issue, and "cannot be used to draw definitive conclusions about brands." Which is all well and good, though we wouldn't blame you for sticking to water for now. In case you hadn't heard, it's remarkably good for you.